You are gazing at a lovely bubbling sauce with plenty of punch… a Puttanesca sauce. Translated in Italian as, ‘in the style of a prostitute’ or ‘whore’s style spaghetti.’ i can only guess it was prepared to ‘lure in’ customers with it’s amazing aroma. 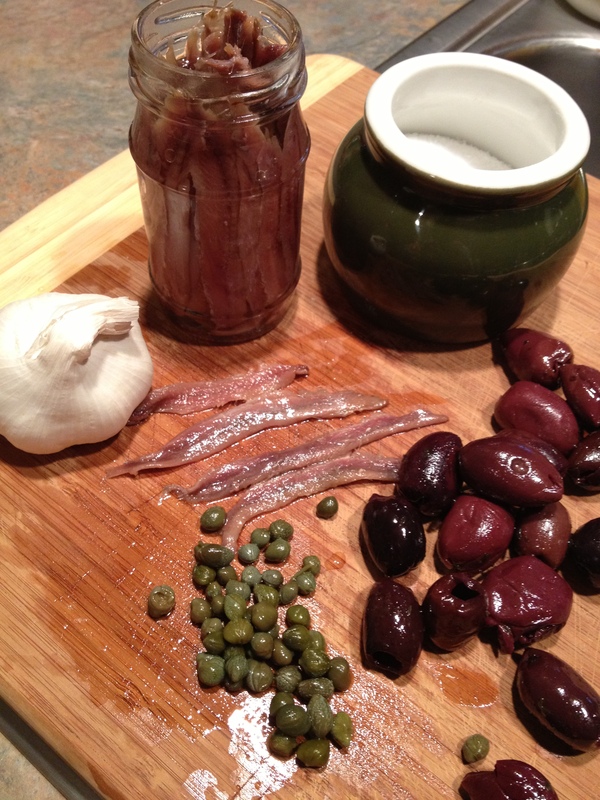 it is said this dish originated sometime around 1960, with it’s basic ingredients being olives, olive oil, capers, tomatoes, garlic and anchovies. you get the saltiness from the capers and anchovies, the punch from the olives, and naturally the forward flavor from the garlic. i prepared this dish late winter, using canned chopped tomatoes- however, i can imagine it would be even more lovely with freshly chopped tomatoes at summer’s end. Traditionally it is served with a spaghetti type noodle- but i chose to use Penne since i yanked it around a bit and added sauteed chicken breast to the mix. i felt it lended a bit more heartiness to an already fabulously rich and seductive dish. the end result was brilliant, and i hope you enjoy it with someone you love (or lust) dearly. cook pasta according to box directions. start your sauce while the water is coming up to a boil. In a heavy skillet (i used a stainless one) over low heat- add your half cup of olive oil. Add your four cloves of minced garlic to this- and cook just until lightly golden (no longer, or you risk burning it) – Add your two cups of tomatoes to this (carefully)- and stir. cook for five minutes this way. 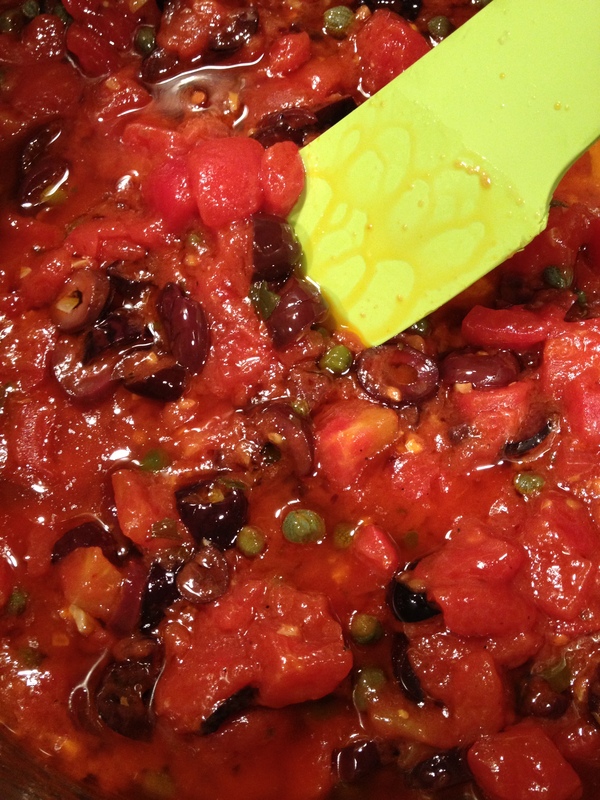 stir in your chopped anchovies, your tomato paste, your capers, olives and red pepper flakes. combine by lightly stirring- and simmer uncovered for ten to 15 mins… stirring occasionally. You can serve it straight up like this, adding about 3/4 of the cooked penne right to the skillet if it’s big enough, or flip flopping and adding the sauce atop your cooked noodles in the noodle pot once they’re drained and rinsed. 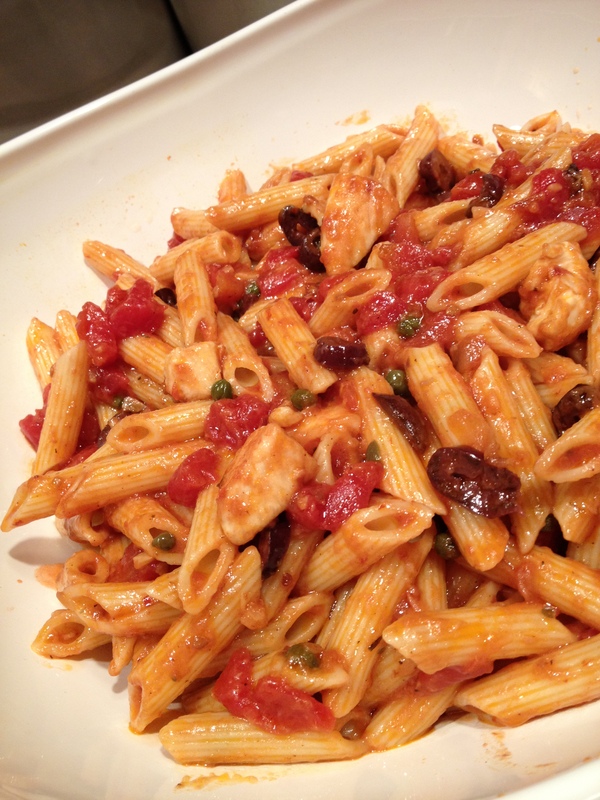 (again, i would only use about 3/4 of your cooked penne, as you want a generous coating of sauce- and the whole lot will run you too thin on the sauce) toss in your chopped parsley, mix lightly and turn out into your favorite serving bowl. If you want to add some sauteed chicken, like i did, prepare it while your sauce is simmering. take your chopped chicken breast and working in two small batches- lightly flour it and saute it in some olive oil and butter in a skillet. brown lighlty- and then add it to the sauce. i believe i then covered the sauce once the cooked chicken was added, and cooked it maybe ten minutes longer on low, allowing the chicken to marry with the sauce a bit. Your call. enjoy!! !